Matthew Katz came to the university with a background in karate, but he said he felt compelled by the recent crimes in College Park to attend a two-hour self-defense class last night at Hillel. "It's a great way to bring people together in an experience that you do not always get," said Katz, a sophomore business government and politics major. "Last year I came for the martial arts, but this year I wanted to refresh my memory if, God forbid, I was ever in a situation where I needed to defend myself." The technique that about 100 students learned is krav maga, a martial art focused on self-defense in hand-to-hand combat most notably used by Israeli security forces in combat. The university's chapter of the Zionist Organization of America hosted the event, which was led by Moshe Katz, an expert from the Mountain Spirit Warrior School of Self-Defense in Israel. Katz exhibited techniques to escape from dangerous situations but emphasized that the right attitude is necessary to overcome attacks. Katz said that too often during attacks, the victim freezes in fear and lacks the correct mindset to escape the situation. "Without the right attitude, technique is useless," he told the class. "You have to go into situation with a winning attitude. You cannot go in thinking you have no chance." Katz, who was born in the United States, began studying karate 20 years ago and moved to Israel a few years later. In Israel, he met Itay Gil, the former trainer of Israel's counter-terror force, and began to study krav maga under him. Katz will spend the next five and a half weeks traveling to college campuses around the country teaching students how to stay safe. Katz spent the class demonstrating how krav maga helps practitioners escape from hand grabs, threats with dangerous weapons and sexual assaults. "One in four women have been sexually assaulted on college campuses," Katz said. "krav maga empowers you, it makes you feel better about yourself and confidence itself can thwart an attack." 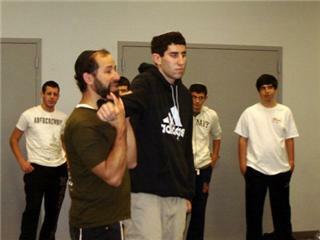 Krav maga focuses on improvisation, Katz said, and its techniques are easy to learn. Users learn to be creative and respond quickly in the face of danger, he said. Katz also emphasized that size and strength matter little during a fight. He demonstrated how to escape from an attacker quickly and easily and gave those on hand a multitude of options, despite their potential size and strength disadvantages. "I assume he's stronger than me," Katz said of a hypothetical attacker. "The strong typically attack the weak, looking for a quick and easy victory." In addition to improving their safety, students said they attended the class to connect with the Israelis who use krav maga. "[Moshe Katz] teaches you how to defend yourself on the street, and especially with the crime in College Park, that is very important," said Zionist Organization of America co-president Aaron Salter, a junior chemical engineering major. "You learn how to protect yourself with a method developed by Jews for Jews." Freshman criminology and criminal justice and psychology major Michele Stern had taken karate before, but she said she had always wanted to study krav maga. "I'm small, so people think I'm a pushover, but I'm not," Stern said. "Krav maga's techniques are directly applicable in my daily life."